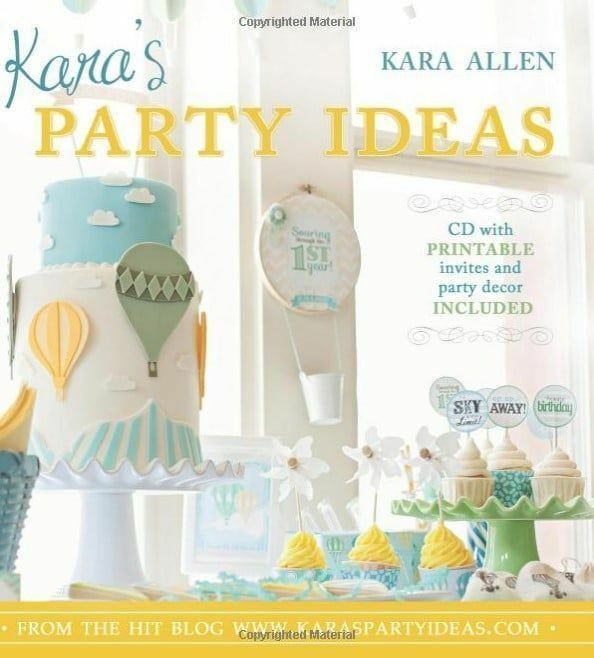 The same day that went on sale I bought in Amazon the Kara's Party Book Ideas of the well-known Kara Allen with great expectations, since he followed her for a few years both in his blog and social networks. Kara Allen started at a very young age to organize small birthday parties, and what was a hobby ended up turning it into a profession that she exercises with great passion. Admittedly, it has a lot of imagination and style, always taking into account the type of party to be set up and for whom it is intended. Many event organizers have it as a point of reference to take ideas (some even copy them as such without further hehe), since during all these last years has organized thousands of events of all kinds, from baby showers, children's birthday parties of characters known, themed parties of everything imaginable (each client has their own different request), weddings, etc. It includes a CD with templates to print that you have used in some of the parties included in the book. Without becoming your reference book, you should have it on your bookshelf and so dispose of it as a reference. Although it is in English, you will make more use of the images than the text, since it simply describes general features what it shows in the photos without going into the detail of the step by step. The good thing about the large number of photographs, is that it includes many details, both from the general view of the party, as well as photos close to the products where you can appreciate a lot of details that will give you lots of ideas. I always recommend buying the hardcover book. They are more elegant and keep the book better, but it is not essential either. In amazon You can also find it in its soft cover version and even for the Kindle, although in this case I do not recommend the electronic version, it is your thing to have it in your hand and enjoy all the pictures.